EasyJet is one of Europe’s lowest cost airlines, operating in over 30 countries, its bright orange branding recognisable at every airport it serves. On its website you can easily book one-way or round-trip flights, paying for extra options such as ‘Speedy Boarding’, as you go along. On their homepage, they clearly list all the countries they operate in, with the option to click on a thumbnail to discover more, including attractions, history and weather. 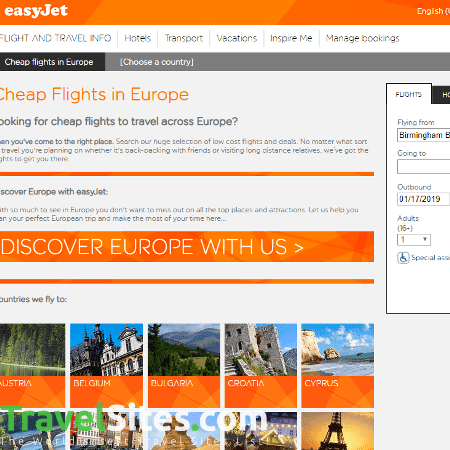 Once you have selected your flight itinerary, the easyJet website displays a number of various options for departure and arrival, while down the right hand column there is a nicely presented checklist of what their fares include. I like this as, on other websites, these extra costs don’t become clear until you have got to the point of getting your credit card out to pay. Their more pricey FLEXI fares give extra convenience when flying, such as Fast Track security, free route changes and easyJet Plus bag drop. However, if you are more budget conscious then easyJet’s display results are also great due to the orange banner informing you of which is the ‘Lowest Fare’ on the dates you’re looking at. For me, the ability to then choose your seat on the aircraft is a nice feature, particularly if you want to be decide whether you are near an aisle or a window, however it comes at an added cost, while extra legroom is much more expensive. The website can feel quite convoluted at times, with links to third-party sites like Booking.com and Europcar displayed on banners across the screen. Nevertheless, its generally a stress-free place to go for booking flights, and certainly at the cheaper end of the scale.